Prices for the various options listed above will vary depending on grade changes, soil conditions, and regional differences. Consult your chain-link dealer for a specific quote for your project. Metallic-coated fabric and posts are the traditional building blocks for chain-link fencing. Strong and sensible, metallic-coated chain-link is the most economical material choice. Due to improved manufacturing processes, today’s metallic-coated chain-link lasts longer than ever, inhibits rust and is available in several different metallic coatings, including galvanized, aluminized, galfan and galvanized. Ask your chain link dealer which metallic coating is right for you. Color-coated chain link is formed when a layer of colored material is applied to a chain-link fence. Coatings are made of either colored vinyl or polymers and should be UV (ultraviolet) stable so colors won’t fade. Color choices include black, green and brown. The color coating also prevents the fence from rusting, helps it blend into the surroundings and has a smoother finish that’s perfect for children. color-coated fence materials and square posts. Stylish caps can be used on the posts to add a final touch of distinction. Chain link fence is ideally suited to enclose gardens and serve as a backdrop to climbing plants. 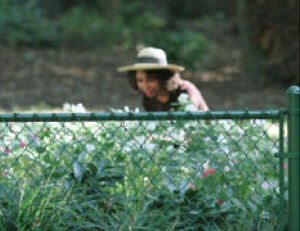 Unlike most fences, chain link is see-through, allowing the beauty of your garden to be admired. It is also an effective barrier against common garden pests and neighborhood children.In addition, chain-link is the perfect choice to serve as a trellis for climbing plants, as its strength combined with its shape provides the structure plants need to take root. Also, unlike wood, chain-link trellises will not rot or require upkeep. If you have any questions about the “Types of Chain Link Fence” contact one of our technical support.